"H. erectus" redirects here. For the seahorse species, see Hippocampus erectus. For the 2007 comedy film, see Homo Erectus (film). For 1997 album, see Homo erectus (album). "Pithecanthropus erectus" redirects here. For the song and album by that title, see Pithecanthropus Erectus (album). For Pithecanthropus erectus erectus, see Java Man. Homo erectus (meaning "upright man", from the Latin ērigere, "to put up, set upright") is an extinct species of hominid that lived throughout most of the Pleistocene geological epoch. Its earliest fossil evidence dates to 1.9 million years ago and the most recent to 70,000 years ago. It is generally thought that H. erectus originated in Africa and spread from there, migrating throughout Eurasia as far as Georgia, India, Sri Lanka, China and Indonesia. There is also another view—an alternative to 1): some paleoanthropologists consider H. ergaster to be a variety, that is, the "African" variety, of H. erectus, and they offer the labels "Homo erectus sensu stricto" (strict sense) for the Asian species and "Homo erectus sensu lato" (broad sense) for the greater species comprising both Asian and African populations. 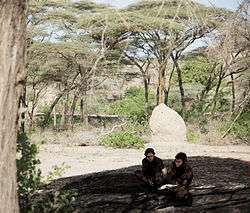 The first hypothesis of origin is that Homo erectus rose from the Australopithecina in East Africa sometime during—or perhaps even before—the Early Pleistocene geological epoch, which itself dates to 2.58 million years ago (see below, at African genesis, re earlier date at Ledi-Geraru Research Area). From there it migrated, in part, by 2.0 mya, probably as a result of broad desertifying conditions developing then in eastern and northern Africa; it joined the migrations through the "Saharan pump" and dispersed around much of the Old World. The fossil record shows that its development from about 1.8 mya to one mya was widely distributed: in Africa (Lake Turkana  and Olduvai Gorge), the Transcaucasus (Dmanisi in Georgia), Indonesia (Sangiran, Central Java and Trinil, East Java), and in Vietnam, China (Zhoukoudian and Shaanxi), and India. The second hypothesis is that H. erectus evolved in Eurasia and then migrated to Africa. They occupied the Dmanisi site from 1.85 million to 1.77 million years ago, which was about the same time or slightly before their earliest evidence in Africa. There are several proposed explanations of the dispersal of H. erectus georgicus—including whether or not Africa is the source). The Dutch anatomist Eugène Dubois was fascinated by Darwin's theory of evolution especially as it applied to humankind. In 1886, he set out for Asia—which then was the region accepted as the cradle of human evolution despite Darwin's theory of African origin; see Haeckel § Research—to find a human ancestor. In 1891, his team discovered a human fossil on the island of Java, Dutch East Indies (now Indonesia). Excavated from the bank of the Solo River at Trinil, in East Java, he named the species Pithecanthropus erectus—from the Greek πίθηκος, "ape", and ἄνθρωπος, "man"—based on a skullcap (calotte) and a femur like that of Homo sapiens. Dubois' 1891 find was the first fossil of a Homo-species (or any hominin species) found as result of a directed expedition and search—and which was inspired by Darwin's radical theory that humans, like all other species, evolved from ancestral species, see human evolution. (The first found and recognized human fossil was the accidental discovery of Homo Neanderthalensis in 1856, see List of human evolution fossils.) The Java fossil from Indonesia aroused much public interest. It was dubbed by the popular press as Java Man; but few scientists accepted Dubois' argument that his fossil was the transitional form—the so-called "missing link"—between apes and humans. Java Man is now classified as Homo erectus. Most of the spectacular discoveries of H. erectus next took place at the Zhoukoudian Project, now known as the Peking Man Site, in Zhoukoudian, China. This site was first discovered by Johan Gunnar Andersson in 1921 and was first excavated in 1921, which produced two human teeth. Canadian anatomist Davidson Black's initial description (1921) of a lower molar as belonging to a previously unknown species (which he named Sinanthropus pekinensis) prompted widely publicized interest. Extensive excavations followed, which altogether uncovered 200 human fossils from more than 40 individuals including five nearly complete skullcaps. German anatomist Franz Weidenreich provided much of the detailed description of this material in several monographs published in the journal Palaeontologica Sinica (Series D). Nearly all of the original specimens were lost during World War II; however, authentic casts were made by Weidenreich which exist at the American Museum of Natural History in New York City and at the Institute of Vertebrate Paleontology and Paleoanthropology in Beijing, and are considered to be reliable evidence. Throughout much of the 20th century, anthropologists debated the role of H. erectus in human evolution. Early in the century, due in part to the discoveries at Java and Zhoukoudian, it was widely accepted that modern humans first evolved in Asia. A few naturalists—Charles Darwin most prominent among them—theorized that humans' earliest ancestors were African: Darwin pointed out that chimpanzees and gorillas, humans' closest relatives, evolved and exist only in Africa. From the 1950s forward, numerous finds in East Africa confirmed the hypothesis of an African genesis, providing fossil evidence that the earliest hominins originated there. It is now generally accepted that H. erectus descended from either: 1) the earliest hominin genera (such as Australopithecus, and possibly Ardipithecus—of which is still debated whether it is hominin or hominid); or 2) the earliest Homo-species (such as Homo habilis or Homo ergaster). East Africa provided sympatric coexistence for H. erectus and H. habilis for several hundred-thousand years, which tends to confirm the hypothesis that they represent separate lineages from a common ancestor; that is, the ancestral relationship between them was not anagenetic, but was cladogenetic, which here suggests that a subgroup population of habilis—or of a common ancestor of habilis and erectus—became reproductively isolated from the main-group population, eventually evolving into the new species Homo erectus. In the 1950s, archaeologists John T. Robinson and Robert Broom named Telanthropus capensis; Robinson had discovered a jaw fragment in 1949 in Swartkrans, South Africa. Later, Simonetta proposed to re-designate it to Homo erectus, and Robinson agreed. In 1961, Yves Coppens discovered a skull of Tchadanthropus uxoris, then the earliest fossil human discovered in north Africa. It was reported that the fossil "had been so eroded by wind-blown sand that it mimicked the appearance of an australopith, a primitive type of hominid". Although at first considered to be a specimen of H. habilis, T. uxoris is no longer considered a valid taxon, and has been subsumed into H. erectus. In 2013, a fragment of fossilized jawbone, dated to around 2.8 million years ago, was discovered in the Ledi-Geraru Research Area in the Afar depression, Ethiopia. The fossil is considered the earliest evidence of the Homo genus known to date, and seems to be intermediate between Australopithecus and H. habilis. The individual lived just after a major climate shift in the region, when forests and waterways were rapidly replaced by arid savannah, which was a domain favored by the early hominins. 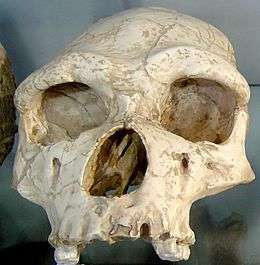 Homo erectus georgicus is the subspecies name assigned to fossil skulls and jaws found in Dmanisi, Georgia. First proposed as a separate species, it is now classified within H. erectus. The site was discovered in 1991 by Georgian scientist David Lordkipanidze. Five skulls were excavated from 1991 forward, including a "very complete" skull in 2005. Excavations at Dmanisi have yielded 73 stone tools for cutting and chopping and 34 bone fragments from unidentified fauna. The fossils are about 1.8 million years old. The fossil skeletons present a species primitive in its skull and upper body but with relatively advanced spine and lower limbs, inferring greater mobility than the previous morphology. It is now thought not to be a separate species, but to represent a stage soon after the transition between H. habilis to H. erectus; it has been dated at 1.8 mya. The assemblage includes one of the largest Pleistocene Homo mandibles (D2600), one of the smallest Lower Pleistocene mandibles (D211), a nearly complete sub-adult (D2735), and a toothless specimen D3444/D3900. Stringer graph-model of the evolution of several species of genus Homo over the last 2 million years (vertical axis). 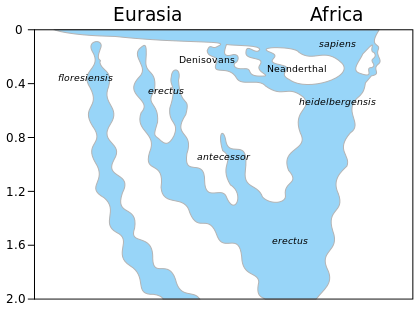 The rapid "Out of Africa" expansion of H. sapiens is indicated at the top of the diagram. Both models show the Asian variety of Homo erectus going extinct recently. And both models indicate species admixture: early modern humans spread from Africa across different regions of the globe and interbred with earlier descendants of H. heidelbergensis / H. rhodesiensis, namely the Neanderthals, Denisovans, as well as unknown archaic African hominins. See admixture; and see Neanderthal admixture theory. The Paleolithic Age (Old Stone Age) of prehistoric human history and industry is dated from 2.6 million years ago to about 10,000 years ago; thus it closely coincides with the Pleistocene epoch of geologic time, which is 2.58 million to 11,700 years ago. The beginning of early human evolution reaches back to the earliest innovations of primitive technology and tool culture. H. erectus were the first to use fire to cook and made hand axes out of stone. East African sites, such as Chesowanja near Lake Baringo, Koobi Fora, and Olorgesailie in Kenya, show potential evidence that fire was utilized by early humans. At Chesowanja, archaeologists found fire-hardened clay fragments, dated to 1.42 mya. Analysis showed that, in order to harden it, the clay must have been heated to about 400 °C (752 °F). At Koobi Fora, two sites show evidence of control of fire by Homo erectus at about 1.5 mya, with reddening of sediment associated with heating the material to 200–400 °C (392–752 °F). At a "hearth-like depression" at a site in Olorgesailie, Kenya, some microscopic charcoal was found—but that could have resulted from natural brush fires. A site at Bnot Ya'akov Bridge, Israel is reported to evidence that H. erectus or H. ergaster controlled fire there between 790,000 and 690,000 BP; to date this claim has been widely accepted. Some evidence is found that H. erectus was controlling fire less than 250,000 years ago. Evidence also exists that H. erectus were cooking their food as early as 500,000 years ago. Re-analysis of burnt bone fragments and plant ashes from the Wonderwerk Cave, South Africa, has been dubbed evidence supporting human control of fire there by 1 mya. H. erectus was probably the first hominin to live in small, familiar band-societies similar to modern hunter-gatherer band-societies; and is thought to be the first hominin species to hunt in coordinated groups, to use complex tools, and to care for infirm or weak companions. There has been debate as to whether H. erectus, and possibly the later Neanderthals, may have interbred with anatomically modern humans in Europe and Asia. See Neanderthal admixture theory. Homo erectus is the most, or one of the most, long-lived species of Homo, having existed well over one million years and perhaps over two million years; Homo sapiens has existed for about 200,000 years. If considering Homo erectus in its strict sense (that is, as referring to only the Asian variety) no consensus has been reached as to whether it is ancestral to H. sapiens or any later hominins (see above, "Interpreting evolution: ..."). The discovery of Homo floresiensis in 2003 and of the recentness of its extinction has raised the possibility that numerous descendant species of Homo erectus may have existed in the islands of Southeast Asia and await fossil discovery (see Orang Pendek). Homo erectus soloensis, who was long assumed to have lived on Java at least as late as about 50,000 years ago but was re-dated in 2011 to a much older age, would be one of them. Some scientists are skeptical of the claim that Homo floresiensis is a descendant of Homo erectus. One explanation holds that the fossils are of a modern human with microcephaly, while another one holds that they are from a group of pygmies. 1 2 Hazarika, Manji (16–30 June 2007). "Homo erectus/ergaster and Out of Africa: Recent Developments in Paleoanthropology and Prehistoric Archaeology" (PDF). ↑ Suwa G, Asfaw B, Haile-Selassie Y, White T, Katoh S, WoldeGabriel G, Hart W, Nakaya H, Beyene Y (2007). "Early Pleistocene Homo erectus fossils from Konso, southern Ethiopia". Anthropological Science. 115 (2): 133–151. doi:10.1537/ase.061203. ↑ Switek, Brian (17 October 2013). "Beautiful Skull Spurs Debate on Human History". National Geographic. Retrieved 22 September 2014. ↑ Frazier, Kendrick (Nov–Dec 2006). "Leakey Fights Church Campaign to Downgrade Kenya Museum's Human Fossils". Skeptical Inquirer magazine. 30 (6). Archived from the original on 2009-01-10. ↑ Prins, Harald E. L.; Walrath, Dana; McBride, Bunny (2007). Evolution and prehistory: the human challenge. Wadsworth Publishing. p. 162. ISBN 978-0-495-38190-7. 1 2 Ferring, R.; Oms, O.; Agusti, J.; Berna, F.; Nioradze, M.; Shelia, T.; Tappen, M.; Vekua, A.; Zhvania, D.; Lordkipanidze, D. (2011). "Earliest human occupations at Dmanisi (Georgian Caucasus) dated to 1.85-1.78 Ma". Proceedings of the National Academy of Sciences. 108 (26): 10432–10436. doi:10.1073/pnas.1106638108. ↑ New discovery suggests Homo erectus originated from Asia. Dnaindia.com. 8 June 2011. ↑ Augusti, Jordi; Lordkipanidze, David (June 2011). "How "African" was the early human dispersal out of Africa?". Quaternary Science Reviews. 30 (11–12): 1338–1342. doi:10.1016/j.quascirev.2010.04.012. ↑ Swisher, Curtis & Lewin 2000, p. 70. ↑ "The First Knock at the Door". Peking Man Site Museum. In the summer of 1921, Dr. J.G. Andersson and his companions discovered this richly fossiliferous deposit through the local quarry men's guide. During examination he was surprised to notice some fragments of white quartz in tabus, a mineral normally foreign in that locality. The significance of this occurrence immediately suggested itself to him and turning to his companions, he exclaimed dramatically "Here is primitive man, now all we have to do is find him!" ↑ from sino-, a combining form of the Greek Σίνα, "China", and the Latinate pekinensis, "of Peking"
↑ "Review of the History". Peking Man Site Museum. During 1927-1937, abundant human and animal fossils as well as artefact were found at Peking Man Site, it made the site to be the most productive one of the Homo erectus sites of the same age all over the world. Other localities in the vicinity were also excavated almost at the same time. ↑ ROBINSON JT (January 1953). "The nature of Telanthropus capensis". Nature. 171 (4340): 33. doi:10.1038/171033a0. PMID 13025468. ↑ Frederick E. Grine; John G. Fleagle; Richard E. Leakey (1 Jun 2009). "Chapter 2: Homo habilis—A Premature Discovery: Remember by One of Its Founding Fathers, 42 Years Later". The First Humans: Origin and Early Evolution of the Genus Homo. Springer. p. 7. 1 2 Kalb, Jon E (2001). Adventures in the Bone Trade: The Race to Discover Human Ancestors in Ethiopia's Afar Depression. Springer. p. 76. ISBN 0-387-98742-8. Retrieved 2010-12-02. ↑ Wood, Bernard (11 July 2002). "Palaeoanthropology: Hominid revelations from Chad" (PDF). Nature. 418 (6894): 133–135. doi:10.1038/418133a. Retrieved 2 December 2010. ↑ Cornevin, Robert (1967). Histoire de l'Afrique. Payotte. p. 440. ISBN 2-228-11470-7. ↑ "Mikko's Phylogeny Archive". Finnish Museum of Natural History, University of Helsinki. Archived from the original on 2007-01-06. ↑ "Oldest known member of human family found in Ethiopia". New Scientist. 4 March 2015. Retrieved 2015-03-07. Ghosh, Pallab (4 March 2015). "'First human' discovered in Ethiopia". bbc.co.uk. Retrieved 7 March 2015. ↑ Vekua A, Lordkipanidze D, Rightmire GP, Agusti J, Ferring R, Maisuradze G, Mouskhelishvili A, Nioradze M, De Leon MP, Tappen M, Tvalchrelidze M, Zollikofer C (2002). 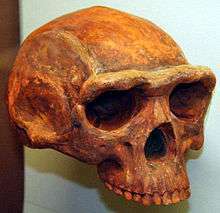 "A new skull of early Homo from Dmanisi, Georgia". Science. 297 (5578): 85–9. doi:10.1126/science.1072953. PMID 12098694. 1 2 Lordkipanidze D, Jashashvili T, Vekua A, Ponce de León MS, Zollikofer CP, Rightmire GP, Pontzer H, Ferring R, Oms O, Tappen M, Bukhsianidze M, Agusti J, Kahlke R, Kiladze G, Martinez-Navarro B, Mouskhelishvili A, Nioradze M, Rook L (2007). "Postcranial evidence from early Homo from Dmanisi, Georgia" (PDF). Nature. 449 (7160): 305–310. doi:10.1038/nature06134. PMID 17882214. ↑ Lordkipanidze, D.; Vekua, A.; Ferring, R.; Rightmire, G. P.; Agusti, J.; Kiladze, G.; Mouskhelishvili, A.; Nioradze, M.; Ponce De León, M. S. P.; Tappen, M.; Zollikofer, C. P. E. (2005). "Anthropology: The earliest toothless hominin skull". Nature. 434 (7034): 717–718. doi:10.1038/434717b. PMID 15815618. ↑ Gibbons, A. (2003). "A Shrunken Head for African Homo erectus" (PDF). Science. 300 (5621): 893a. doi:10.1126/science.300.5621.893a. ↑ Tattersall, I.; Schwartz, J. H. (2009). "Evolution of the GenusHomo". Annual Review of Earth and Planetary Sciences. 37: 67–92. doi:10.1146/annurev.earth.031208.100202. ↑ Rightmire, G. P.; Lordkipanidze, D.; Vekua, A. (2006). "Anatomical descriptions, comparative studies and evolutionary significance of the hominin skulls from Dmanisi, Republic of Georgia". Journal of Human Evolution. 50 (2): 115–141. doi:10.1016/j.jhevol.2005.07.009. PMID 16271745. ↑ Gabunia, L.; Vekua, A.; Lordkipanidze, D.; Swisher Cc, 3.; Ferring, R.; Justus, A.; Nioradze, M.; Tvalchrelidze, M.; Antón, S. C.; Bosinski, G.; Jöris, O.; Lumley, M. A.; Majsuradze, G.; Mouskhelishvili, A. (2000). "Earliest Pleistocene hominid cranial remains from Dmanisi, Republic of Georgia: Taxonomy, geological setting, and age". Science. 288 (5468): 1019–1025. doi:10.1126/science.288.5468.1019. PMID 10807567. 1 2 Bower, Bruce (3 May 2006). "Evolutionary back story: Thoroughly modern spine supported human ancestor". Science News. 169 (18): 275–276. doi:10.2307/4019325. ↑ Wilford, John Noble (19 September 2007). "New Fossils Offer Glimpse of Human Ancestors". The New York Times. Retrieved 9 September 2009. ↑ Rightmire, G. Philip; Van Arsdale, Adam P.; Lordkipanidze, David (2008). "Variation in the mandibles from Dmanisi, Georgia". Journal of Human Evolution. 54 (6): 904–8. doi:10.1016/j.jhevol.2008.02.003. PMID 18394678. ↑ Ian Sample (17 October 2013). "Skull of Homo erectus throws story of human evolution into disarray". The Guardian. ↑ Weidenreich, F. (1943). "The "Neanderthal Man" and the ancestors of "Homo Sapiens"". American Anthropologist. 45: 39–48. doi:10.1525/aa.1943.45.1.02a00040. JSTOR 662864. ↑ Jelinek, J. (1978). "Homo erectus or Homo sapiens?". Rec. Adv. Primatol. 3: 419–429. ↑ Wolpoff, M.H. (1984). "Evolution of Homo erectus: The question of stasis". 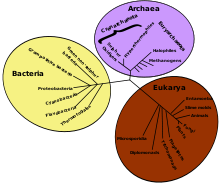 Palaeobiology. 10 (4): 389–406. JSTOR 2400612. 1 2 Swisher, Carl Celso III; Curtis, Garniss H. and Lewin, Roger (2002) Java Man, Abacus, ISBN 0-349-11473-0. 1 2 Stringer, C. (2012). "What makes a modern human". Nature. 485 (7396): 33–35. doi:10.1038/485033a. PMID 22552077. 1 2 "Figure 5. Temporal and Geographical Distribution of Hominid Populations Redrawn from Stringer (2003)" (edited from source), in Reed, David L.; Smith, Vincent S.; Hammond, Shaless L.; et al. (November 2004). "Genetic Analysis of Lice Supports Direct Contact between Modern and Archaic Humans". PLOS Biology. San Francisco, CA: PLOS. 2 (11): e340. doi:10.1371/journal.pbio.0020340. ISSN 1545-7885. PMC 521174 . PMID 15502871. 1 2 Whitfield, John (18 February 2008). "Lovers not fighters". Scientific American. ↑ "The Pleistocene Epoch". University of California Museum of Paleontology. Retrieved 22 August 2014. ↑ The Earth Institute. (2011-09-01). Humans Shaped Stone Axes 1.8 Million Years Ago, Study Says. Columbia University. Accessed 5 January 2012. ↑ Gibbons, Ann (13 March 1998). "Paleoanthropology: Ancient Island Tools Suggest Homo erectus Was a Seafarer". Science. 279 (5357): 1635–1637. doi:10.1126/science.279.5357.1635. 1 2 3 4 5 James, Steven R. (February 1989). "Hominid Use of Fire in the Lower and Middle Pleistocene: A Review of the Evidence" (PDF). Current Anthropology. University of Chicago Press. 30 (1): 1–26. doi:10.1086/203705. Retrieved 2012-04-04. ↑ Rincon, Paul (29 April 2004). "Early human fire skills revealed". BBC News. Retrieved 2007-11-12. 1 2 Pollard, Elizabeth (2015). Worlds Together, Worlds Apart. New York: Norton. p. 13. ISBN 978-0-393-92207-3. ↑ Leakey, Richard (1992). Origins Reconsidered. Anchor. pp. 257–58. ISBN 0-385-41264-9. ↑ Boehm, Christopher (1999). Hierarchy in the forest: the evolution of egalitarian behavior. Cambridge: Harvard University Press. p. 198. ISBN 0-674-39031-8. ↑ Owen, James (30 October 2006). "Neanderthals, Modern Humans Interbred, Bone Study Suggests". National Geographic News. Retrieved 2008-01-14. 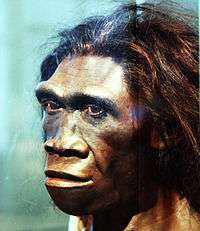 ↑ Finding showing human ancestor older than previously thought offers new insights into evolution, 5 July 2011. ↑ Delson E, Harvati K, Reddy D, et al. (April 2001). "The Sambungmacan 3 Homo erectus calvaria: a comparative morphometric and morphological analysis". The Anatomical Record. 262 (4): 380–97. doi:10.1002/ar.1048. PMID 11275970. ↑ Ciochon R, Long VT, Larick R, et al. (April 1996). "Dated co-occurrence of Homo erectus and Gigantopithecus from Tham Khuyen Cave, Vietnam". Proceedings of the National Academy of Sciences of the United States of America. 93 (7): 3016–20. doi:10.1073/pnas.93.7.3016. PMC 39753 . PMID 8610161. ↑ Schuster, Angela M. H. (September–October 1998). "New Skull from Eritrea". Archaeology. Archaeological Institute of America; republished online at archive.org. Retrieved 3 October 2015. ↑ Kappelman J, Alçiçek MC, Kazanci N, Schultz M, Ozkul M, Sen S (January 2008). "First Homo erectus from Turkey and implications for migrations into temperate Eurasia". American Journal of Physical Anthropology. 135 (1): 110–16. doi:10.1002/ajpa.20739. PMID 18067194.